Just a few of years ago it was nearly impossible to find decent chocolate shop in London and the only option was the prestigious department stores like Harrods, Fortnum & Mason and Selfridges. This year I discovered the following shops in London. Some of them might opened though in late 2011. Choccywoccydoodah is located in the hub of bubbly Soho. They expertise in their extravagant chocolate creations. They also have a cafe located in the upper floor, which I haven't had the chance to visit yet. Daskalides is located on Long Acre in Covent Garden. They have a cafe in the basement and they serve hot chocolate. I discovered Ruby Violet visiting Brockley Market in South East London later this year they opened an ice cream parlour in Kentish Town. Unlike most of the ice cream in London. Julie an English lady prepares the ice cream to the English tradition and she's doing it very well. Harrods scraped its old chocolate bar and opened this year the Godiva chocolate bar. The latest edition is the chocolate museum. 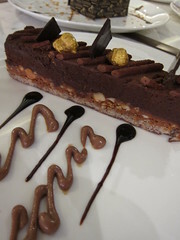 Isabelle from Melange in Peckham opened last month the chocolate museum, the first one of its kind in London. I visited in the opening day and it wasn't ready, but hopefully after the new year there will more to it.